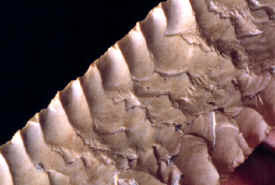 "CLICK ON PICTURE FOR LARGE IMAGE"
Many people seem to agree that this large Dalton point may be one of the most skillfully made Dalton points to have surfaced in many years. Its most significant trait is the very peculiar curved flaking pattern that some people have termed "Z" flaking, although hardly any of the flakes make a true Z shape. But many of the flakes do curve in a way that is atypical to Dalton flaking. These "zigzagging" pressure flakes are very uniform and parallel. No one seems to understand how it was done and so far have not been able to duplicate this technique. It has been speculated that Dalton people may have used some type of pressure flaking device to drive off either "hollow ground" or "Z" pressure flakes. Most Dalton points would have been made with either a copper or antler pressure flaker that was held in the hand. This Dalton point was surface collected 20 years ago in a cultivated field just north of Sedalia, Missouri in Pettis County. 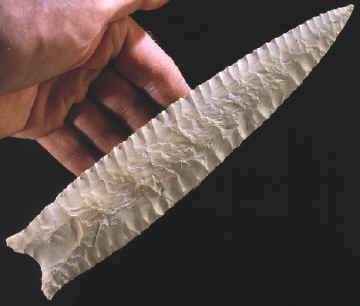 It's made of white Burlington chert and measures 8 1/2 inches long.